Over 10,000 people on bicycles are now crossing Dublin’s canals into the city centre for the first time in modern traffic counts, according to Dublin City Council and the National Transport Authority. Last month we reported from pre-report data showing how there has been a 160% increase in cycling into Dublin City Centre between 2004-2014 and a 14.2% increase between 2013 and 2014 — the full report now shows the mode share of 5.4% and that the actual number of people on bicycles is now at 10,349 people. Year-on-year, walking is up 12.7%, car and taxi use combined is down 3.2%, and the number of bus passengers is “relatively flat” despite the number of buses being down 2.3%. The number of goods vehicles. Detail of these modes is below. The Canal Cordon Count includes traffic counts on two days in November each year at 33 locations around the cordon formed by the Royal and Grand Canals. The count only record inbound movements between 07:00 and 10:00. Rail, bus and tram passenger survey figures are added to this to find modal share of the amount of people crossing the canal. Cycling is growing stronger within the canals, where a 22.5% increase between 2013 and 2014 was recorded in a city centre count. This is viewed to be down to the expansion of DublinBikes. The bike rental stations are nearly fully contained within the canals, so few DublinBike movements are counted by the Canal Cordon Count. Residents within the canals — many of whom cycle — and train commuters with their own bicycles are also not counted by the Canal count. As we reported recently, Dublin City Council data from the last 10 years shows a 160% increase in cycling into Dublin City Centre between 2004-2014. 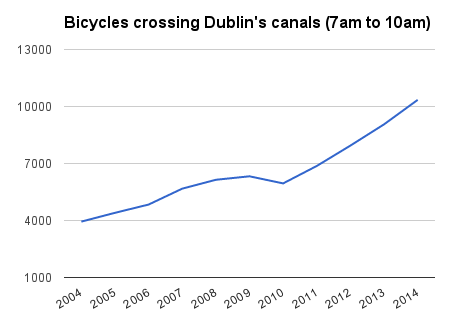 The final Canal Corden report, for an unknown reason, only looks at the 8 years between 2006 and 2014 which shows that the “volume of cyclists crossing the canal cordon during the morning peak period has increased by 114%”. The report said that “bus patronage remained relatively flat from 2013 to 2014”, while the number of buses is down — “from 1,539 buses in 2013 to 1,504 in 2014, a decrease of 2.3%”. Overall the modal share of public transport including bus, Luas tram and rail is close to 50% (48.38%). While car drivers and passengers represent 33.3% of people crossing the canals. The goods vehicles crossing the cordon in the peak morning period increased by 4% between 2013 and 2014, up from 1,045 vehicles in 2013 to 1,087 vehicles in 2014. But this still represents a decreased by 52.5% since 2006. We need to remember that the situation outside of Dublin City remains bleak with a national modal-split of 1.35% reported in the 2013 National Travel Survey (CSO). The NCPF target of 10% of everyday trips to be made by bike by 2020 is unattainable at this rate of progress with a mere five years left. Politicians and policy-makers have a case to answer for this pathetic outcome. Is there no understanding about what is required to decarbonise the Irish transport system? The opposition transport spokespersons are totally silent. Commuters should be paid to not reach for the car keys for short trips; those willing to cycle should be rewarded; parking charges should be increased markedly; fines for parking in cycling infrastructure should be set far higher than €60. Above all stop celebrating the fact that new car registrations are heading back to boom times. Mike McKillan is right. The rest of Ireland needs to get on board. But to do that, the cycling advocates and state officials in charge of this area of development, need to study what the hold backs are. What are the areas of concern? How far is the commute of the average person outside of Dublin? Ask open ended questions. Let them tell you why. I see too many leading “surveys” done by people who promote bike lanes over real infrastructure. So I would encourage you to get to the heart of the matter. Either way Congrats! on such a marvelous achievement.